Established in 1998, Daimler AG is a German automotive corporation best known for being responsible for the Mercedes-Benz brand. It also manages other car, bus, truck and motorcycle brands including Mercedes-AMG, Mercedes-Maybach, smart, Freightliner, Western Star, BharatBenz, Fuso, Setra, Thomas Built Buses, Mercedes-Benz Bank, Mercedes-Benz Financial, Daimler Truck Financial, moovel, and car2go. It employs over 275,000 people around the world and in 2014 sold 2,545,985 vehicles (1,722,561 being passenger cars). 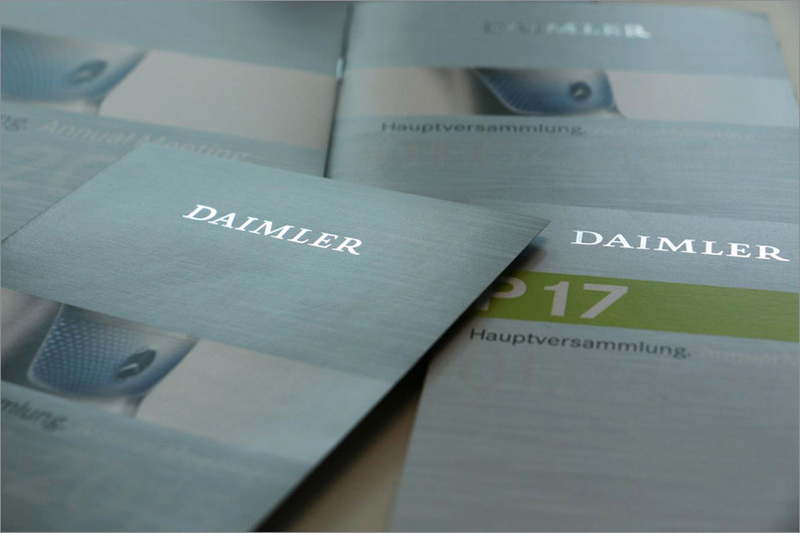 Earlier this year, Daimler previewed a new corporate identity at its Annual Shareholders’ Meeting and this past November officially introduced it. No design credit given. Most likely in-house. An extremely detailed, thorough, and wordy microsite devoted to the brand and identity can be found here. Future silver is as a guiding color the umbrella brand dominate and modernize the consolidated presence both internally and externally: The Daimler-word trademark (logo) is presented in high gloss chrome in a silver brushed aluminum surface, remains formally unchanged. 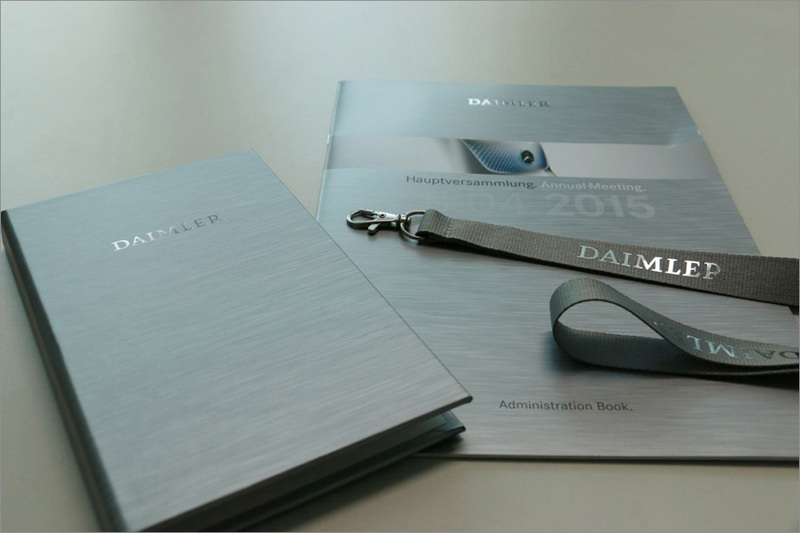 The new corporate design is to emphasize the premium quality of Daimler even more clearly than before the world. 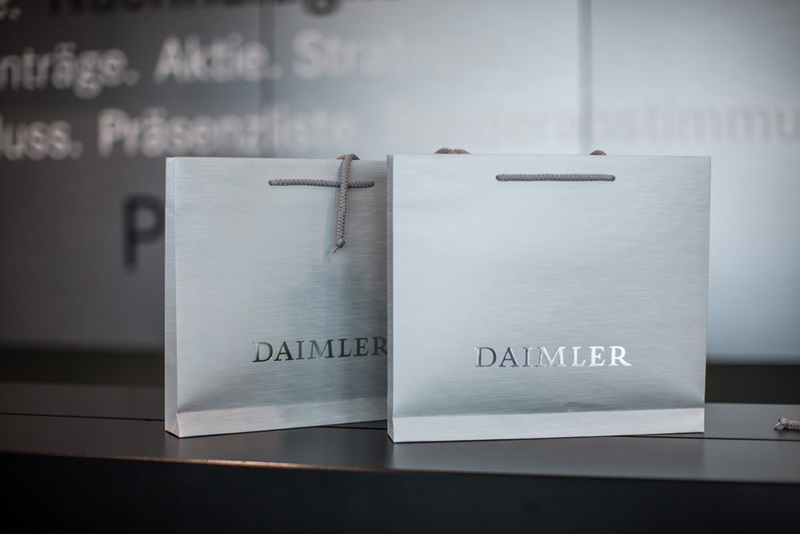 The silver-colored logo and the new guiding color stand for modernity, elegance and high tech and underline the proximity to Mercedes-Benz, the most valuable automotive brand, Daimler. Logo detail. On white and against “brushing”. If you had asked me last night what the Daimler AG logo looked like I would have had no idea. A common occurrence with parent company logos. It turns out to be a decent but forgettable serif in all uppercase. Before it was blue. Now it’s silver. Not only is it silver, it’s silver-silver. Like, non-stop. The logo itself remains the same but it serves as the first indicator that Daimler’s new look is all about silver and a brush-steel look. The sovereign character and significance of the logotype prohibit its use on trivial objects. The corporate logotype is used only on materials of high quality and that will show no signs of wear and tear. 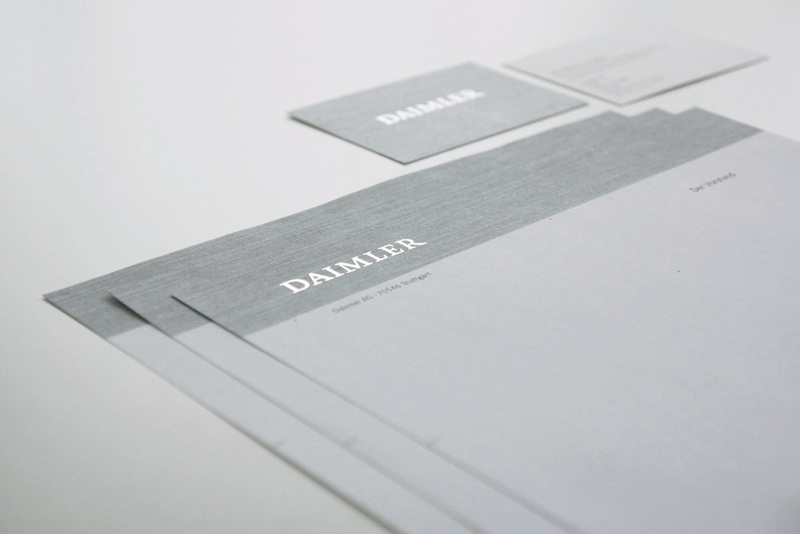 The Daimler logotype is silver in color. On printed media, it is produced in silver hot-foil embossing. As an exception, it can also be applied in four-color (4C) printing. Four-color printing yields a 3-D simulation of the logotype used to visually depict its silvery shine. 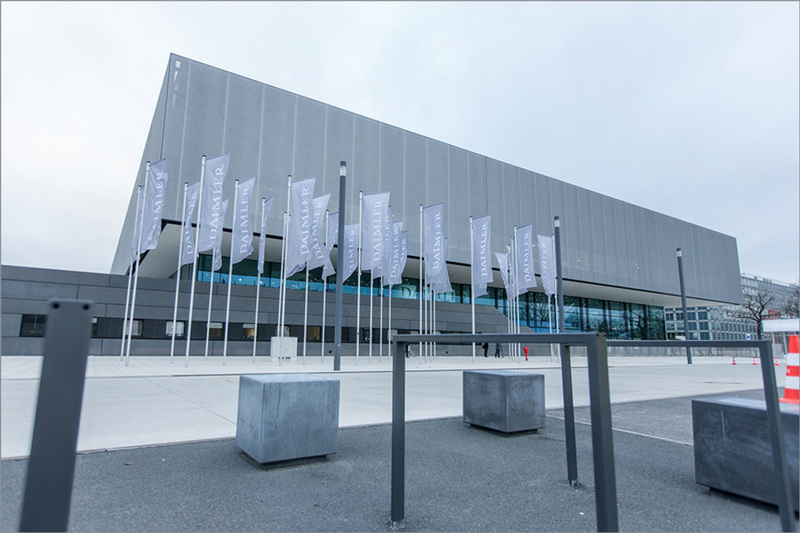 Daimler Annual Shareholders’ Meeting 2015. Various materials from the meeting. 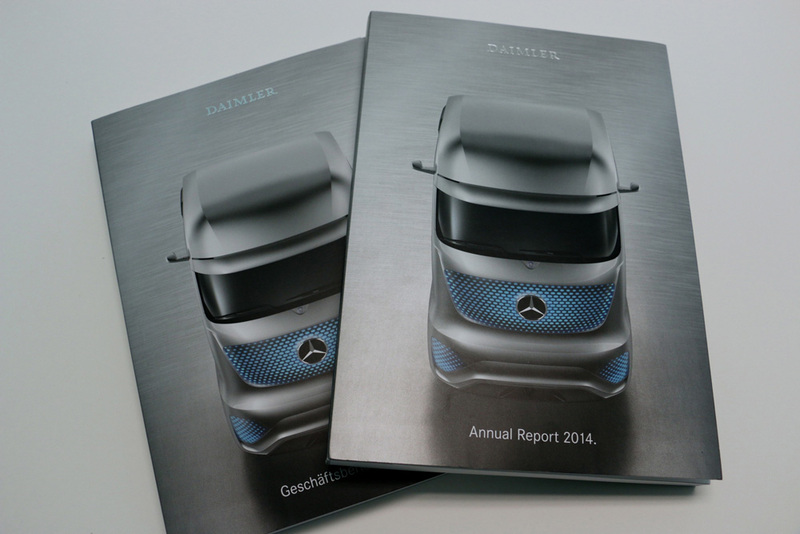 You have to hand it to Daimler: They’ve gone method with this this silver approach and there is no stopping it. I don’t particularly like it but it’s hard to disagree when the identity is done with such precision, commitment, and expert budget-allocation for foil stamping. 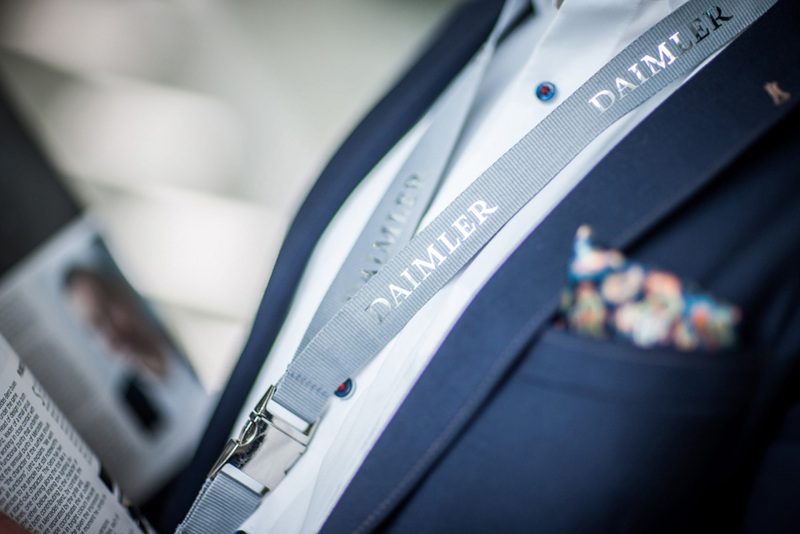 The identity manages to look luxurious and extremely corporate, keeping Daimler’s presence as that of a parent company not trying to steal the thunder of its consumer brands. Overall, the all-silver approach can be a turn-off by default but this is probably as decent as it gets before turning into a faux-finish bonanza. Established in 1998, Daimler AG is a German automotive corporation best known for being responsible for the Mercedes-Benz brand. It also manages other car, bus, truck and motorcycle brands including Mercedes-AMG, Mercedes-Maybach, smart, Freightliner, Western Star, BharatBenz, Fuso, Setra, Thomas Built Buses, Mercedes-Benz Bank, Mercedes-Benz Financial, Daimler Truck Financial, moovel, and car2go. It employs over 275,000 people around the world and in 2014 sold 2,545,985 vehicles (1,722,561 being passenger cars). 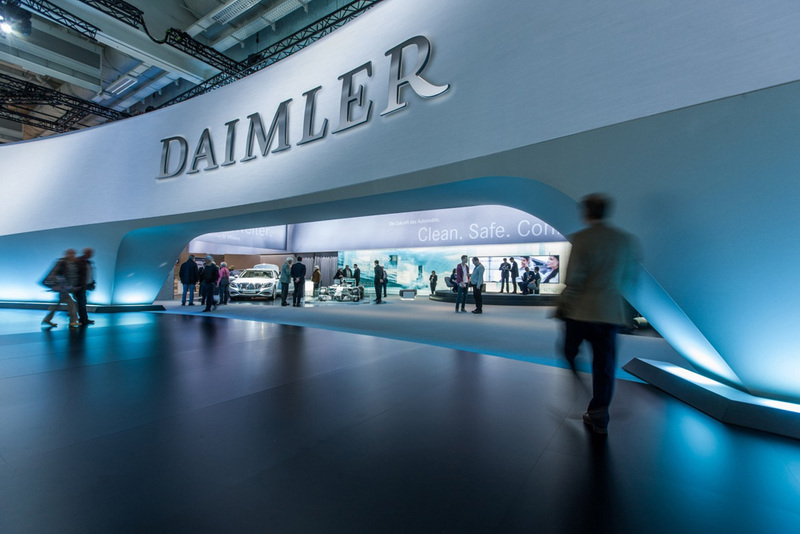 Earlier this year, Daimler previewed a new corporate identity at its Annual Shareholders' Meeting and this past November officially introduced it. No design credit given. Most likely in-house.